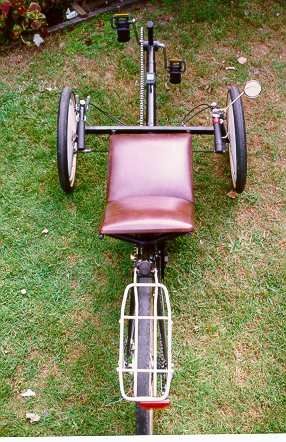 Short construction description of a SWB tadpole design Trike with 26' rear wheels and 24" fronts. 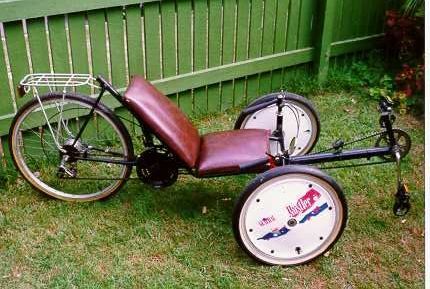 This is a short description of a SWB tadpole design Trike with 26' rear wheels and 24" fronts. 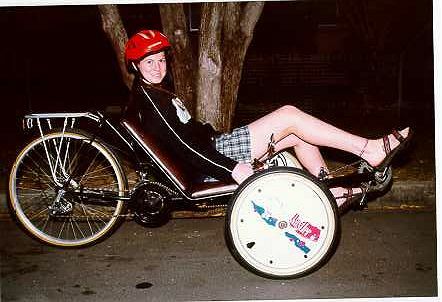 The frame is cut from a 27' push-bike with 26" wheel installed in the rear. 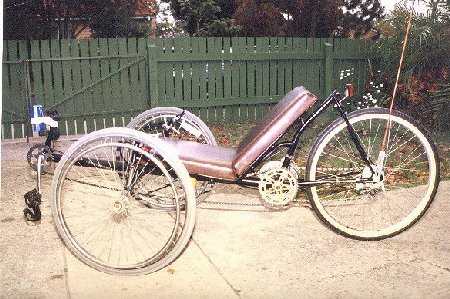 The Wheelbase 1.25m & Track 0.8 m dimensions are the same as the smaller 20" version. 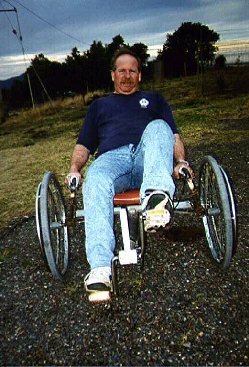 As you can see 24" wheel chair wheels are used up front with the pusher bars left on at present until they are respoked for wheel rigidity. 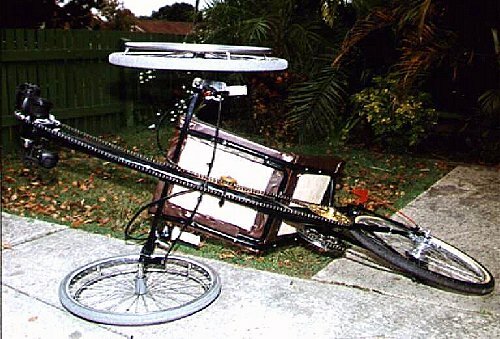 I'm not an expert on bike wheels by any stretch of the imagination but it doesn't appear to be so strong in the original form as the spokes do not cross each other. After about 6 months of riding we now have decided to try 20" wheels on the front because of the narrow choice on 24" tyres. 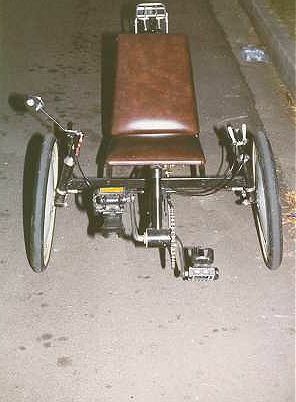 This does lower the front a bit but still gives enough clearance for the pedal arms. 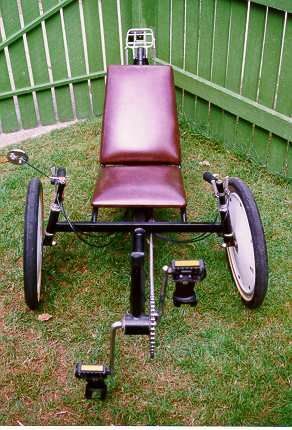 The front steering system was taken from a ride on mower after cutting off the heavy cross member and replacing it with a much lighter rectangular tube. This has now also been replaced but normal push bike steering heads as we couldn't get the play the handlebars had in their mounting on the kingpin. We opted to have 2 separate chains, one running from the left front to an intermediate shaft and the other as per a normal bike. This gives a wider range of gearing and is easier to suspend the length of chain. 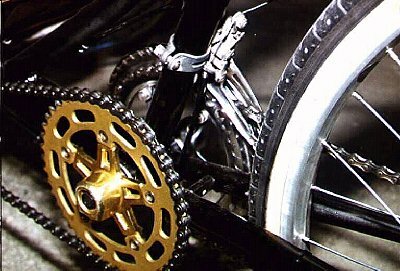 The left intermediate is a spider with the cog mounted on the outside as it hits the rear fork in it's normal position because of the shorter axle length on that side. We had to do a bit of work on the front axle which bent in an accident. The original axle was weakened when it was ground to fit the wheel bearings. 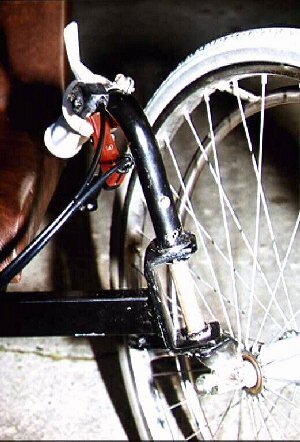 It was cut off and a tube welded below it to mount the existing wheel chair axles which are hardened steel. The weakest part at present is the handlebars which don't hold so solid onto the kingpin which extend up through it. A bolt passes through both but leaves quite a bit of play which is hard to fasten. 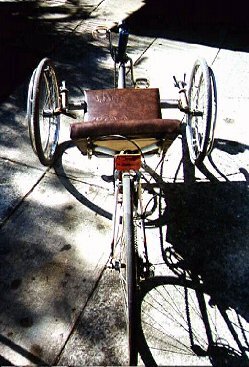 The seat frame is an old kitchen chair with 5 ply for the base and foam and vinyl covering stapled to the rear. It is best to paint or varnish the exposed wood to protect it from road waste flung form the wheels. We reshaped the bike frame a little by bending the riser tube back and rewelding it's contact with the rear forks. This places the weight further back which helps with braking and lowers the frontal area. 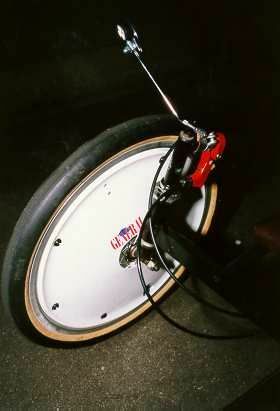 The rear wheel is a Sach 2 x 6 with drum brake. At present there are 24 gears but doesn't give enough range both higher and lower although there is plenty of scope to modify it. 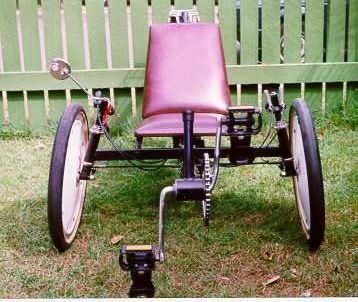 What would probably work best would be by adding a 3 sprocket front but the derailleur would need to be mounted upside down and rear derailleur or chain tensioner setup and 1 rotation backwards of the pedals to change the gears. This would give it 72 gears and although not all (or even half) are needed would give the required range. 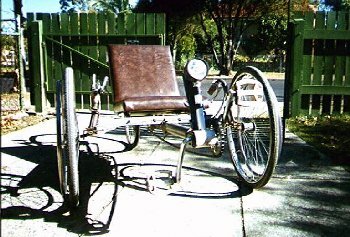 The trike has been changed quite a bit now sporting 20" front wheels and push bike front steering bearing instead of the ride on mower type. Smaller front wheels has made the handling a bit touchy, especially with wheel covers on.